After king Amon of Judah was assassinated, his son Josiah, at the age of eight, became king of Judah. He reigned for thirty-one years, until he was killed by the Egyptian Pharaoh Neco on the battlefield of Megiddo. David his father, and he did not turn aside to the right or to the left. discovery of the sacred sefer ha Torah. Jeremiah the prophet was the son of a priest called Hilkiah, who would be roughly contemporary with the Hilkiah of Josiah but Hilkiah the father of Jeremiah served as a priest in Anathoth. although his use of language connects him with the Deuteronomistic history. the definite article. In 2 Chronicles, a connection with Moses is emphasised: sefer Torat Hashem b’yad Moshe. While reporting to the king on the business of paying the workmen with Temple silver, Shaphan told him about the scroll and read it to him. 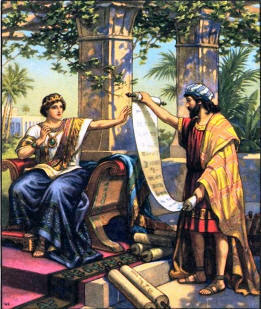 In the account of Josiah in 2 Chronicles, he begins his reforms before the discovery of the scroll. God – Lechu dirshu et Hashem – concerning the words of the scroll. This they did by consulting the prophetess Huldah who lived in Jerusalem. after other gods, and committed evil deeds. However, Josiah would be spared the sight of this, as he was repentant, so the destruction of Jerusalem would not occur in his lifetime. Josiah went to the Temple and had the sefer ha brit read to all the people, great and small. He then destroyed the idolatrous altars, beginning with those in the Temple. the LORD, where the women wove hangings for the Asherah. He destroyed all idolatrous centres in and around Jerusalem, and beyond, including the altar at Bethel. This was the altar about which the man of God in 1 Kings 13 had prophesied to Jeroboam that human bones would be burned on the altar. Josiah fulfilled this prophecy, then went on to destroy the pagan altars of Samaria, after which returned to Jerusalem. this Passover was kept to the LORD in Jerusalem. The expression ‘no such Passover’ resembles the locution that there was no king, before or since, such as Josiah, no prophet such as Moses. No Passover like it had been kept in Israel since the days of Samuel the prophet. security of the Temple precinct. They were also scribes and teachers. Was the scroll the book of Deuteronomy? supplementary chapters are a review of the history of God’s relationship with the Israelites in the wilderness and the imminence of entering the Promised Land. Deuteronomy is believed to be written in stages between the 7th century BCE and the early 5th. The term Deuteronomistic history was coined in 1943 by the German biblical scholar Martin Noth, referring to the authorship of Deuteronomy, Joshua, Judges, Samuel and Kings which he believed were argued the work of a sixth century historian seeking to explain the fall of Jerusalem and the Babylonian exile. In the so-called Deuteronomistic history, Israel goes through a cycle of infidelity, punishment and restoration, ultimately facing exile by the end of 2 Kings. 6th-century author in a version which he called Deuteronomy 2. Deuteronomy 1 is positive towards Judah and negative towards Israel and its kings. Deuteronomy 2, written in exile according to Frank Moore Cross, adds warnings of a broken covenant, followed by punishment and exile. his kingdom, he and his children, in Israel. These laws show that the king is subordinate to the Torah and in fact the only duty prescribed for a king is that he should read Torah every day, fear God and keep the commandments. It does not require that he should be a military leader or a judge, although the kings often filled these roles, or that he should have quantities of horses and wives, although this was precisely the manner of Solomon’s rule. writing of Deuteronomy. Levinson argues that the Deuteronomistic author of Kings reverses the Law of the King, as found in Deuteronomy, by showing Josiah as the instigator and advocate of the Law. Josiah follows Deuteronomy on Passover, commanding the people to observe it and presiding over the centralized festival. command, and Deuteronomy’s Law of the king, as the monarch now leads the cultus. briefly and idealistically, denied him. narrative are about the Israelites being about to enter the Promised Land, an analogy with the end of the exile, when they were about to return to it. Josiah became king of Judah in about 641/640 BC, when the Assyrian Empire was beginning to disintegrate. Babylon and Egypt jostled for ascendancy but neither had yet achieved it so Josiah was able to rule without external interference. In 609, Pharaoh Neco II led an army up to the Euphrates River to aid the Assyrians. Josiah attempted to block Neco’s advance at Megiddo, and in the course of the battle, Josiah was killed. Magdolos with the Syrians, and conquered them. actions of King David as a pattern and a rule to him in the whole conduct of his life. and destroyed the altars which previous kings had permitted. he had lived thirty-nine years, and of them had reigned thirty-one. women have spoken of Josiah in their laments to this day. Neco killing Josiah at Megiddo, but does not mention the battle. You shall be gathered to your grave in peace. said the king unto his servants, Carry me away out of the battle; for I am very weak. Three were called by their names before they were born: Isaac, Solomon and Josiah. There are many parallels between the narratives of King Josiah and King Hezekiah,and, next time, we can look more closely at the reign of Hezekiah, about a hundred years before Josiah.